"Russian dolls" redirects here. For other uses, see Matryoshka (disambiguation). "Russian Dolls" redirects here. For the film, see Russian Dolls (film). "Russian Doll" redirects here. For the TV show, see Russian Doll (TV series). A set of matryoshkas consists of a wooden figure, which separates, top from bottom, to reveal a smaller figure of the same sort inside, which has, in turn, another figure inside of it, and so on. 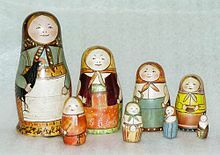 The first Russian nested doll set was made in 1890 by Vasily Zvyozdochkin from a design by Sergey Malyutin, who was a folk crafts painter at Abramtsevo. Traditionally the outer layer is a woman, dressed in a sarafan, a long and shapeless traditional Russian peasant jumper dress. The figures inside may be of either gender; the smallest, innermost doll is typically a baby turned from a single piece of wood. Much of the artistry is in the painting of each doll, which can be very elaborate. The dolls often follow a theme; the themes may vary, from fairy tale characters to Soviet leaders. In the west, Matryoshka dolls are often erroneously referred to as "babushka dolls", babushka meaning "grandmother" or "old woman". The first Russian nested doll set was carved in 1890 at the Children's Education Workshop by Vasily Zvyozdochkin and designed by Sergey Malyutin, who is a folk crafts painter in the Abramtsevo estate of Savva Mamontov, a Russian industrialist and patron of arts. . Mamontov's brother, Anatoly Ivanovich Mamontov (1839-1905) created the Children's Education Workshop to make and sell children's toys. The doll set was painted by Malyutin. Malyutin's doll set consisted of eight dolls—the outermost was a mother in a traditional dress holding a red-combed rooster. The inner dolls were her children, girls and a boy, and the innermost a baby. The Children's Education Workshop was closed in the late 1890s, but the tradition of the matryoshka simply relocated to Sergiyev Posad, the Russia city known as a toy-making center since the fourteenth century. The origin of the inspiration for matroyshka dolls is not clear. It is believed that Zvyozdochkin and Malyutin were inspired by eastern Asian culture, for example the doll Honshu, named after the main island of Japan, however the Honshu figures cannot be placed one inside another. Sources differ in descriptions of the doll, describing it as either a round, hollow daruma doll, portraying a bald old Buddhist monk, or a Seven Lucky Gods nesting doll. Savva Mamontov's wife presented the dolls at the Exposition Universelle in Paris, where the toy earned a bronze medal. Soon after, matryoshka dolls were being made in several places in Russia and shipped around the world. Common themes of Matryoshkas are floral and relate to nature. Often Christmas, Easter and religion are used as themes for the doll. Modern artists create many new styles of the nesting dolls, mostly as an alternative purchase option for tourism. These includes animal collections, portraits and caricatures of famous politicians, musicians, athletes, astronauts, "robots," and popular movie stars. Today, some Russian artists specialize in painting themed matryoshka dolls that feature specific categories of subjects, people or nature. Areas with notable matryoshka styles include Sergiyev Posad, Semionovo (now the town of Semyonov), Polkhovsky Maidan, and Kirov. In the late 1980s and early 1990s during Perestroika, freedom of expression allowed the leaders of the Soviet Union to become a common theme of matryoshka, with the largest doll featuring then-current leader Mikhail Gorbachev. These became very popular at the time, affectionately earning the nickname of a "Gorby", namesake of Gorbachev. With the periodic succession of Russian leadership after the collapse of the Soviet Union, newer versions would start to feature Russian presidents Boris Yeltsin, Vladimir Putin, and Dmitry Medvedev. Most sets feature the current leader as the largest doll, with the predecessors decreasing in size. The remaining smaller dolls may feature other former leaders such as Leonid Brezhnev, Nikita Khrushchev, Joseph Stalin, Vladimir Lenin, and sometimes several historically significant Tsars such as Nicholas II and Peter the Great. Yuri Andropov and Konstantin Chernenko almost never appear due to the short length of their respective terms. Some less-common sets may feature the current leader as the smallest doll, with the predecessors increasing in size, usually with Stalin or Lenin as the largest doll. Some sets that include Yeltsin preceding Gorbachev were made during the brief period between the establishment of President of the RSFSR and the collapse of the Soviet Union, as both Yeltsin and Gorbachev were concurrently in prominent government positions. During Medvedev's presidency, Medvedev and Putin may both share the largest doll due to Putin still having a prominent role in the government as Prime Minister of Russia. As of Putin's re-election as the fourth President of Russia, Medvedev will usually succeed Yeltsin and preceded Putin in stacking order, due to Putin's role solely as the largest doll. 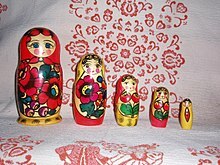 Political matryoshka usually range between 5 and 10 dolls per set. The largest set of matryoshka dolls in the world is a 51-piece set hand-painted by Youlia Bereznitskaia of Russia, completed in 2003. The tallest doll in the set measures 53.97 centimetres (21.25 in); the smallest, 0.31 centimetres (0.12 in). Arranged side-by-side, the dolls span 3.41 metres (11 ft 2.25 in). Matryoshka is often seen as a symbol of the feminine side of Russian culture. Matryoshka is associated in Russia with family and fertility. Matryoshka dolls are a traditional representation of the mother carrying a child within her and can be seen as a representation of a chain of mother's carrying on the family legacy through the child in their womb. Furthermore, Matryoshka dolls are used to illustrate the unity of body, soul, mind, heart and spirit. Matryoshkas are also used metaphorically, as a design paradigm, known as the “matryoshka principle” or “nested doll principle”. It denotes a recognizable relationship of “object-within-similar-object” that appears in the design of many other natural and crafted objects. Examples of this use include the matrioshka brain, the Matroska media-container format, and the Russian Doll model of multi-walled carbon nanotubes. ^ Russian doll. (n.d.). Collins English Dictionary Complete & Unabridged 10th Edition. Retrieved April 14, 2016. ^ Oxford English Dictionary Online. Accessed 2011-03-25. ^ a b c "Matryoshka – Soul of Russia". Russian Life. Retrieved 2011-10-23. ^ a b Billington, James H. (2004). Russia in search of itself. Woodrow Wilson Center Press. pp. 148, 208. ISBN 978-0-8018-7976-0. Retrieved 2016-04-30. ^ Holmes, Gillian. "Matryoshka Doll". How Products Are Made. Advameg, Inc. Retrieved 31 March 2019. ^ Kostomárova, Elena (2015-08-08). "More than just a pretty face: The secrets of the Russian matryoshka". Retrieved 2018-08-31. ^ "Три матрешки" (Three Matryoshkas), Vokrug sveta, July 1980. 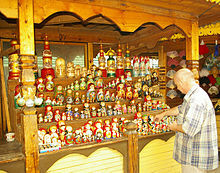 ^ "Eastern roots of the most famous Russian toy". Russian Geographical Society. 2011-03-24. Archived from the original on March 1, 2014. ^ "Matryoshka dolls". FromRussia. Retrieved 2017-07-05. ^ "Largest Russian nesting doll (matryoshka)". guinnessworldrecords.com. Retrieved 15 January 2017. ^ 1939-, Hubbs, Joanna (1993) . Mother Russia: the feminine myth in Russian culture (1st Midland Book ed.). Bloomington: Indiana University Press. p. 19. ISBN 978-0253208422. OCLC 29539185. ^ Kostomárova, Elena (2015-08-08). "More than just a pretty face: The secrets of the Russian matryoshka". pp. 8–12. Retrieved 2018-09-30. ^ M., Shapiro, Rami (2012). Writing – the sacred art: beyond the page to spiritual practice. Shapiro, Aaron (Quality paperback ed.). Woodstock, VT: SkyLight Paths Pub. p. 137. ISBN 978-1594733727. OCLC 767566167. ^ Janet, Baljeu (2012). Downloading spirit : babushka. Xlibris. ISBN 978-1469157641. OCLC 934717840. ^ Holland, John (2007). Power of the soul : inside wisdom for an outside world (1st ed.). Carlsbad, CA: Hay House. p. 3. ISBN 978-1401910853. OCLC 70836680.